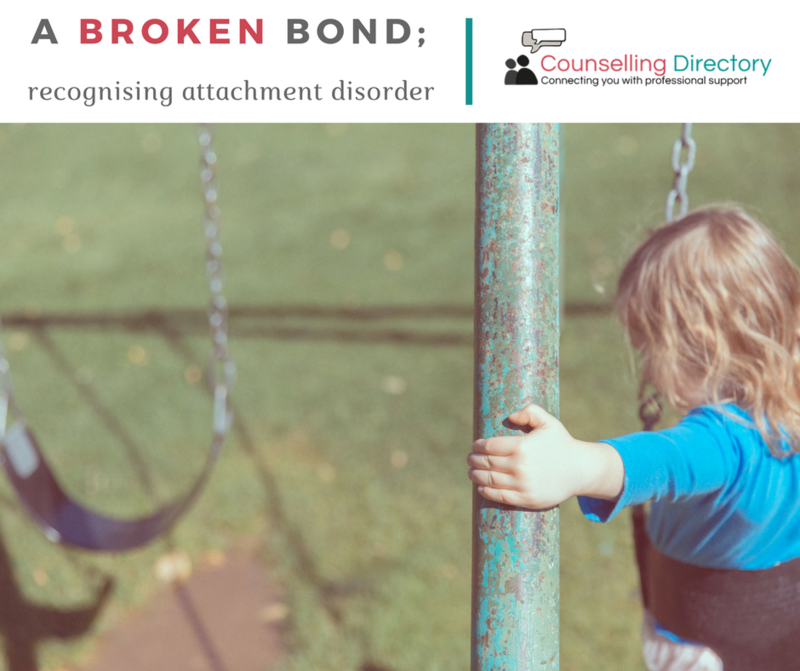 We take an in-depth look at broken bonds in childhood and how you can recognise the signs of attachment difficulties. If you’re a parent, you will no doubt remember what that rush of love felt like when you first set eyes on your child. Chemically, this rush of love is all down to oxytocin, known as the love hormone. During your little one’s early years, the bond you build is naturally made stronger. Physical touch, interaction and other caring behaviours all intensify this attachment bond and oxytocin production, allowing your child to feel safe and secure. Feeling safe in this way helps babies to learn and develop more easily – because they trust that you are there for them if anything goes wrong. For some families, however, this bond is either missing or damaged. There are many reasons why this can happen, ranging from abuse and neglect to a parent falling ill and being unable to care for their child. Whatever the reason, in some children this leads to attachment difficulties or even attachment disorder. Attachment disorder is considered rare in the general population, but is more common in those in the care system. A Danish study estimated prevalence of attachment disorder in infants aged 18 months to be 0.9%. Rates of attachment disorder have also been found to be higher in deprived areas. 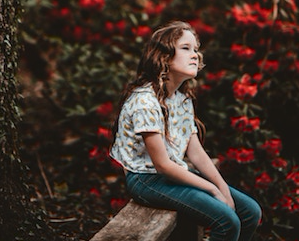 A UK based study found the prevalence of reactive attachment disorder to be 1.4% in children aged 6-8 in a deprived area. Without treatment, attachment difficulties and attachment disorder can hugely impact the child’s life. It can lead to relationship issues, difficulty managing emotions, behavioural problems, depression, low self-esteem and social difficulties. 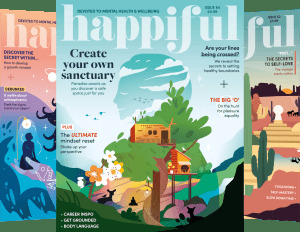 With early recognition, treatment and support – the outlook is much sunnier. To get a better understanding of the importance of attachment, let’s go back to its roots. A great deal of our current understanding of attachment stems from John Bowlby and his theory of attachment. In the 1930s Bowlby worked in a Child Guidance Clinic in London as a psychiatrist. Whilst here, he treated many children with emotional difficulties. Seeing these children’s experiences, Bowlby began to consider the importance of the child’s relationship with their parent and how this affected development. Tying in his work with that of fellow psychiatrists Harlow and Lorenz, Bowlby put forward his evolutionary theory of attachment. In the past, thoughts around attachment were more simplistic – one theory was that children would bond with whoever fed them. Bowlby suggested something different. His theory suggested that it was not all about the food, but in fact all about care and responsiveness. His theory also suggested that the crucial period for developing attachments was between 0 and 5 years. 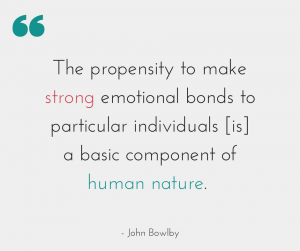 At the time of Bowlby’s work, it was considered that broken bonds were irreparable and the damage would be “irreversible”. Thoughts around this have changed in recent years, however. Guidelines from the National Institute of Health and Care Excellence (NICE) for attachment disorder focus on recognising signs of difficulties early on and prevention. 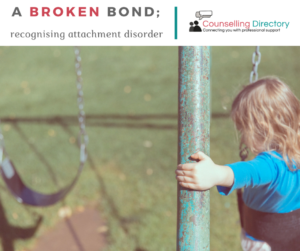 They also say there is a need for anyone who may be involved with children to understand the signs of attachment difficulties (and ideally be able to intervene). This includes those working in the education system, foster carers, adoptive parents and anyone working in care institutions. offers little response (and doesn’t smile) when interacting with adults. It’s important to note that the effects of attachment difficulties work on a spectrum and that no two children are alike. If you suspect attachment disorder, speaking to a mental health professional is the best way to get a diagnosis and further support. Recent research is finding that despite what Bowlby originally thought – broken bonds can be repaired, even in adulthood. While of course, this process is easier in our child’s early years, it does shine hope on the fact that it is never too late to create positive change. Getting professional support should be your first port of call. Once a diagnosis has been made, a treatment plan can begin. The family’s safety will be a top priority. After this is established, a combination of parenting classes and therapy is often recommended. This can include play therapy and family therapy. Parents are encouraged to have an active role in the treatment as they are integral to rebuilding bonds. The process is an interactive one which should involve you following and responding to your child’s emotional needs. Another point to remember is that attachment is often non-verbal (especially in very young children). Eye contact, tone of voice, facial expressions, body movement and even posture all play a part. All children are different, so working with a professional and seeing what works with your child is key. Finally, it is worth noting that both parent and child should feel safe in their own bodies before attempting to repair broken bonds. If either party is stressed, overwhelmed or anxious, making connections can be difficult. Practice self-care and aim to reduce stress – our children often feed off our emotions, so look to set a calming example. If you’re struggling to cope, you are not alone. Remember that it’s OK for you to need a helping hand as well as your child. Search for support groups near you or online, and consider if speaking to a counsellor yourself could be helpful. How to hurt your children when divorcing: A top 20 guide Have you time?